The Best European Lifestyle blogs from thousands of top European Lifestyle blogs in our index using search and social metrics. Data will be refreshed once a week. 2.11 Come Here To Me! | Dublin Life & Culture. European Lifestyle newsletter is a comprehensive summary of the day's most important blog posts and news articles from the best European Lifestyle websites on the web, and delivered to your email inbox each morning. To subscribe, simply provide us with your email address. London About Blog The Resident is the flagship title for a family of luxury London lifestyle magazines published by Archant. Celebrating the best of life in London, the magazines cover everything from famous inhabitants and their creative endeavours to the latest on the local food scene, as well as interiors inspiration, wellbeing, beauty, fashion and how to travel in style. Facebook fans 45,654. Twitter followers 8,678. London Town About Blog London On The Inside is a lifestyle guide for curious Londoners. LOTI unlocks the best places to eat, drink, shop and do in London and surrounds. Giving you news, reviews and recommendations on discoveries, experiences and those hidden gems. Facebook fans 14,203. Twitter followers 350,371. Dublin,Ireland About Blog Pippa is one of Ireland's best known models. She set up pippa.ie in 2013, a popular fashion, beauty & lifestyle blog. Facebook fans 247,503. Twitter followers 78,127. Berlin About Blog We live in Berlin and we heart it so much that we have to share our love for it by running this blog. Facebook fans 77,831. Twitter followers 5,648. Paris, France About Blog This website can help you find a romantic restaurant, activities with your kids, plan your next visit, discover places and treasures or share practical information on life in Paris. Facebook fans 7,867. Twitter followers 559. Manchester, UK About Blog WhatEmmaDid.com is a 'blogtique' ran by Fashion, Beauty and Lifestyle Writer Emma Campbell. Whatemmadid.com provides all fashion, beauty and lifestyle news, and is also an online dress boutique. The 'blogtique' offers a one stop blog and boutique shopping destination. Facebook fans 5,550. Twitter followers 12,989. London, England About Blog SilverSpoon London is a fun and fabulous blog fusing London life, foodie adventures and luxury travel. The blog gives a low-down on London’s hottest new restaurants as well as cool and inspiring destinations globally. Facebook fans 4,131. Twitter followers 20,245. Dublin, Ireland About Blog Award-winning blogger turned businesswoman, Suzanne Jackson, is the brains behind one of Ireland’s leading fashion, beauty and lifestyle blog SoSueMe.ie. Facebook fans 313,000. Twitter followers 49,413. Dublin City, Ireland About Blog Indulgeme.ie is Ireland’s newest lifestyle magazine created for smart, sophisticated and stylish women, who love fashion, beauty and interiors. Facebook fans 643. Twitter followers 2,797. Manchester About Blog A Fashion & Lifestyle Blog authored by Best Fashion Influencer and Style Blogger Megan Ellaby. Facebook fans n/a. Twitter followers 21,507. 11. Come Here To Me! | Dublin Life & Culture. Dublin,Ireland About Blog Come Here To Me! is a group blog that focuses on the life and culture of Dublin city. Music, history, football, politics and pub crawls all feature, along with much more. Facebook fans 11,569. Twitter followers 5,629. Paris About Blog Glose is a lifestyle blog, a blog of trends, ideas for outings to Paris, moments of life, and mood tickets. Facebook fans 1,848. Twitter followers 1,558. London About Blog A London lifestyle blog full of food, fashion, culture, craft, design and fun, and frolics. The Founder Poppy makes her way around London, armed with a camera, reviewing cafes, boutiques, hotels and fun, hidden parts of London. Facebook fans 10,579. Twitter followers 34,300. Berlin, Germany About Blog A lifestyle expat travel blog about culture, history, Brexit, the Royal Family, travels around the world, Europe, and being British in Berlin! Facebook fans n/a. Twitter followers 3,465. Edinburgh, Scotland About Blog The blog covers everything from travel guides and restaurant reviews to fashion wishlists and outfit posts. There are also plenty of beauty product reviews, blogging tips, life advice posts and tips about going freelance. Plus, as I’m based Edinburgh, there’s lots of local content too featuring my favourite haunts in the city. Facebook fans 267. Twitter followers 3,647. Manchester, UK About Blog Full time I'm an ambitious International Marketing Manger for Beauty, in my part time I'm an enthusiastic British Fashion, Beauty and Lifestyle blogger and YouTuber from Manchester, UK. Facebook fans 693. Twitter followers 5,242. Manchester About Blog A fashion, travel and lifestyle blog covering the latest trends and luxury travel destinations as well as the best places to eat in Manchester. Facebook fans n/a. Twitter followers 2,120. About Blog Bistro Chic is a petite collection of musings related to world travel and culture and how we can make small lifestyle changes to bring more joie de vivre (joy of living) into our everyday lives. Facebook fans n/a. Twitter followers 109. Edinburgh About Blog The Little Things is an award-nominated, Edinburgh based, UK travel and lifestyle blog, created and run by Louise Brown. Focusing on finding positivity in every day and seeking sanctuary in the moments once previously overlooked, it aims to inspire you with the latest city and adventure guides. Facebook fans 247. Twitter followers 2,653. About Blog EuropeanLife is an exclusive magazine that gives the reader a glimpse into the luxury life and pleasures on the European continent. Facebook fans 2,413. Twitter followers 220. Hamburg, Germany About Blog Comfort Zone is a personal lifestyle blog from Hamburg. Blogger Jana Kalea writes about fashion, travel, food and Hamburg content. Facebook fans 562. Twitter followers 68. Kansas City, MO About Blog If you love Europe, even a little bit and are curious to know how to add a little bit of the lifestyle into your daily routine, this blog is for you! Facebook fans 139. Twitter followers 53. 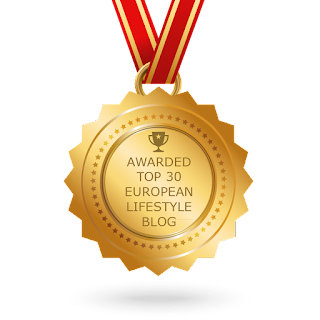 CONGRATULATIONS to every blogger that has made this Top European Lifestyle Blogs list! This is the most comprehensive list of best European Lifestyle blogs on the internet and I’m honoured to have you as part of this! I personally give you a high-five and want to thank you for your contribution to this world.